At the initiation of the Honourable Geoff Regan, P.C., M.P., Speaker of the House of Commons of Canada and the Honourable George Furey, Q.C., M.P., Speaker of the Senate of Canada, the Hon. 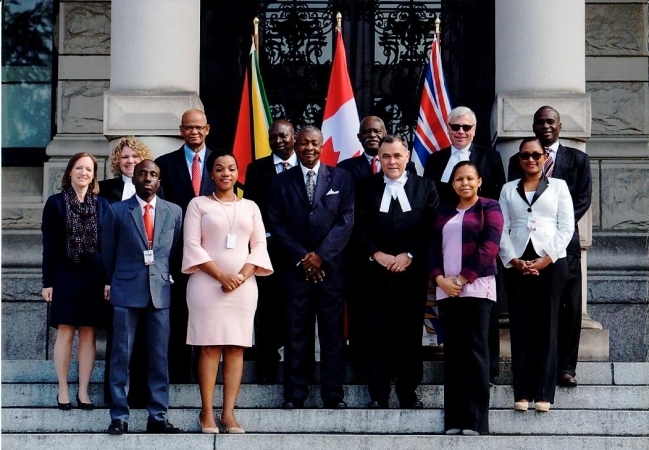 Dr. Barton Scotland, O.R., C.C.H., M.P., Speaker of the National Assembly of the Parliament of Guyana led a delegation to Canada in the week of May 28. The other members of Guyana’s delegation included the Hon. Winston Felix, M.P., Minister of Citizenship, Mr Clement Rohee, M.P., Mr. Sherlock Isaacs, A.A., Clerk of the National Assembly, Mr Ashley, Hinds, Systems Development Officer, Ms Jocette Bacchus, Clerk of Committees/Personal Assistant to the Speaker of the National Assembly, Ms Keshanna Murledhar, and Mr Leslie James, D.S.M., Assistant Commissioner of Police. The objectives of the visit were to have bilateral discussions on parliamentary practices and procedures, to consider the security measures employed at the Parliament of Canada and the Legislative Assembly of British Columbia, and to seek opportunities to consolidate the existing relationship between the National Assembly of the Parliament of Guyana and the Legislative Assembly of British Columbia. A Partnership Agreement was signed between the Parliament of Guyana and the Legislative Assembly of British Columbia, in Guyana, on 17th January, 2017. During the visit to Canada, the Delegation was afforded the opportunity to meet with the Speakers of the House of Commons and the Senate, the Speaker of the Legislative Assembly of British Columbia, Members of the Federal Parliament and Members of the Legislative Assembly of British Columbia to exchange ideas on parliamentary practices and procedures, and the workings of the Committees, among other areas of mutual interest. In achieving its security enhancement objective, the delegation was afforded the opportunity of meeting with the Chief Superintendent and Director of the Parliamentary Protective Service, the Sergeant-at-Arms of the Legislative Assembly of British Columbia, and were given insight into the security procedures employed at the Federal Parliament and the Legislative Assembly of British Columbia. The delegation intends to consider the information in its quest to implement measures to bolster the security employed at the Parliament of Guyana. The Delegation received much support from Her Excellency Clarissa Riehl, High Commissioner of Canada to Guyana and her staff during the visit to Canada.